Engineers at the University of California San Diego [UCSD] have developed neutrophil “nanosponges” that can safely absorb and neutralize a variety of proteins that play a role in the progression of rheumatoid arthritis. Injections of these nanosponges effectively treated severe rheumatoid arthritis in two mouse models. Administering the nanosponges early on also prevented the disease from developing. This work is one of the latest examples of therapeutic nanosponges developed by Zhang’s lab. Zhang, who is affiliated with the Institute of Engineering in Medicine and Moores Cancer Center at UC San Diego, and his team previously developed red blood cell nanosponges to combat and prevent MRSA infections and macrophage nanosponges to treat and manage sepsis. 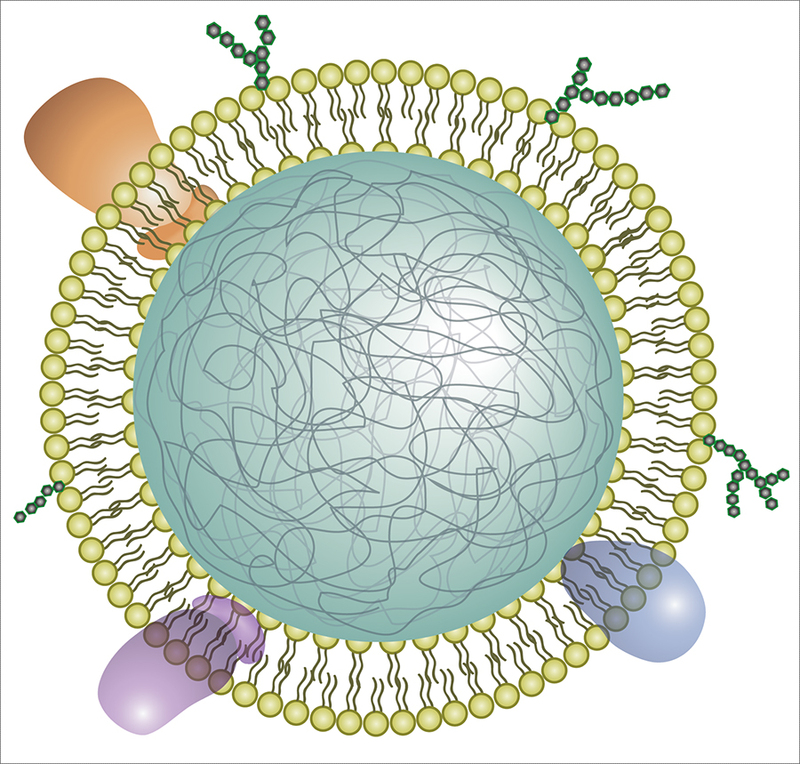 Illustration of a neutrophil cell membrane-coated nanoparticle. The new nanosponges are nanoparticles of biodegradable polymer coated with the cell membranes of neutrophils, a type of white blood cell. Neutrophils are among the immune system’s first responders against invading pathogens. They are also known to play a role in the development of rheumatoid arthritis, a chronic autoimmune disease that causes painful inflammation in the joints and can ultimately lead to damage of cartilage and bone tissue. When rheumatoid arthritis develops, cells in the joints produce inflammatory proteins called cytokines. Release of cytokines signals neutrophils to enter the joints. Once there, cytokines bind to receptors on the neutrophil surfaces, activating them to release more cytokines, which in turn draws more neutrophils to the joints and so on. The nanosponges essentially nip this inflammatory cascade in the bud. By acting as tiny neutrophil decoys, they intercept cytokines and stop them from signaling even more neutrophils to the joints, reducing inflammation and joint damage. These nanosponges offer a promising alternative to current treatments for rheumatoid arthritis. Some monoclonal antibody drugs, for example, have helped patients manage symptoms of the disease, but they work by neutralizing only specific types of cytokines. This is not sufficient to treat the disease, said Zhang, because there are so many different types of cytokines and pathological molecules involved. “Neutralizing just one or two types might not be as effective. So our approach is to take neutrophil cell membranes, which naturally have receptors to bind all these different types of cytokines, and use them to manage an entire population of inflammatory molecules,” said Zhang. “This strategy removes the need to identify specific cytokines or inflammatory signals in the process. Using entire neutrophil cell membranes, we’re cutting off all these inflammatory signals at once,” said first author Qiangzhe Zhang, a Ph.D. student in Professor Liangfang Zhang’s research group at UC San Diego. To make the neutrophil nanosponges, the researchers first developed a method to separate neutrophils from whole blood. They then processed the cells in a solution that causes them to swell and burst, leaving the membranes behind. The membranes were then broken up into much smaller pieces. Mixing them with ball-shaped nanoparticles made of biodegradable polymer fused the neutrophil cell membranes onto the nanoparticle surfaces. “One of the major challenges of this work was streamlining this entire process, from isolating neutrophils from blood to removing the membranes, and making this process repeatable. We spent a lot of time figuring this out and eventually created a consistent neutrophil nanosponge production line,” said Qiangzhe Zhang. In mouse models of severe rheumatoid arthritis, injecting nanosponges in inflamed joints led to reduced swelling and protected cartilage from further damage. The nanosponges performed just as well as treatments in which mice were administered a high dose of monoclonal antibodies. The nanosponges also worked as a preventive treatment when administered prior to inducing the disease in another group of mice. Professor Liangfang Zhang cautions that the nanosponge treatment does not eliminate the disease. “We are basically able to manage the disease. It’s not completely gone. But swelling is greatly reduced and cartilage damage is minimized,” he said. The team hopes to one day see their work in clinical trials. This entry was posted in medicine, nanotechnology and tagged arthritis, bone tissue, cartilage, chronic autoimmune disease, cytokines, Diana Dehaini, inflammation, joints, Julia Zhou, Liangfang Zhang, Lifen Zhang, monoclonal antibody drugs, nanoparticles of biodegradable polymer, nanosponges, Neutrophil membrane-coated nanoparticles inhibit synovial inflammation and alleviate joint damage in inflammatory arthritis, neutrophil nanosponges, neutrophils, Qiangzhe Zhang, rheumatoid arthritis, Ronnie H. Fang, therapeutic nanosponges, UCSD, University of California San Diego, Weiwei Gao, Xiangyu Chen, Yue Zhang on April 8, 2019 by Maryse de la Giroday.